San Diego Chargers quarterback Philip Rivers warms up for the team’s game against the Denver Broncos. Courtesy of San Diego Chargers Facebook. 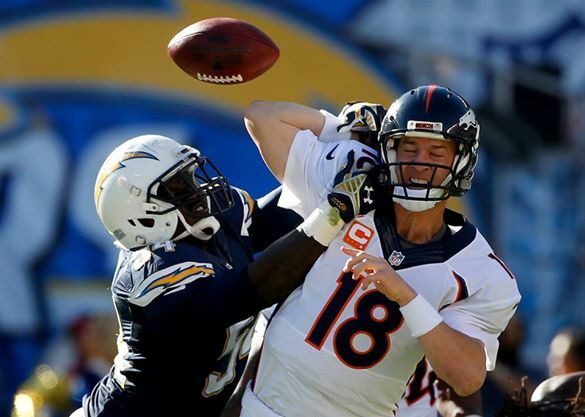 The San Diego Chargers dropped their second game in a row in a 22-10 loss to the Denver Broncos on Sunday in what was the last game at Qualcomm Stadium for the 2014 season. With the loss, the Chargers (8-6) no longer control their own destiny to get into the playoffs and will need to win their remaining two games, along with a loss from the Pittsburgh Steelers and Baltimore Ravens, as they currently hold the No. 8 seed in American Football Conference (AFC). They also no longer have a chance of winning the AFC West division because the Broncos clinched the division with their win on Sunday. Coming into the game the Chargers held the No. 6 seed, which is the last seed to enter the post-season. It was a sloppy outing for the Bolts offense, that mustered just one touchdown late in the fourth quarter, and saw two missed field goals from the normally reliable kicker Nick Novak, who had only missed one field goal all season entering the game. It wasn’t just Novak’s fault, though. 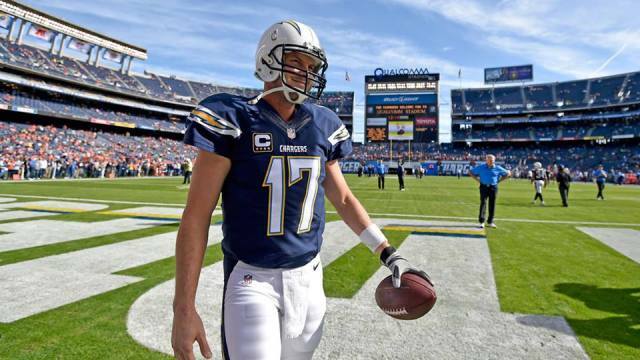 For the second straight week quarterback Philip Rivers failed to find his rhythm with the offense, and his two interceptions—both coming in the fourth quarter—thwarted any chance for a comeback by the Chargers. Rivers finished the day with a pedestrian line of 24-31 for 242 yards, and was not aided by his running attack that accounted for just 56 yards due to the absence of starting running back Ryan Mathews (ankle). “Against a very good team obviously, we made too many mistakes,” Head Coach Mike McCoy said in the post-game press conference. Much like how the offense could not get things going last week against the New England Patriots, the defense held a future-Hall of Fame quarterback in check for back-to-back games. San Diego Chargers outside linebacker Melvin Ingram forces a fumble on Denver Broncos quarterback Peyton Manning in the first quarter of Sunday’s game. Courtesy of San Diego Chargers Facebook. Denver quarterback Peyton Manning was stopped in the red-zone on three different occasions in the first half—twice near the goal-line—and going into halftime the Chargers trailed 9-3. The second half was not much kinder to Manning either, but a 28-yard touchdown pass to wide receiver Demaryius Thomas, and two more field goals from kicker Connor Barth (who went 5-5 on the day) were the difference makers. Even though the defense held Manning to just one touchdown, some believe it wasn’t enough. “At the end of the day as a defense, we have to keep them to fewer points than we have. As a team, we didn’t get it done,” safety Darrell Stuckey said post-game to Chargers.com. Next on the schedule for the Chargers is the San Francisco 49ers (7-7) who they will play in a special Saturday night matchup at 5:25 p.m. in San Francisco.